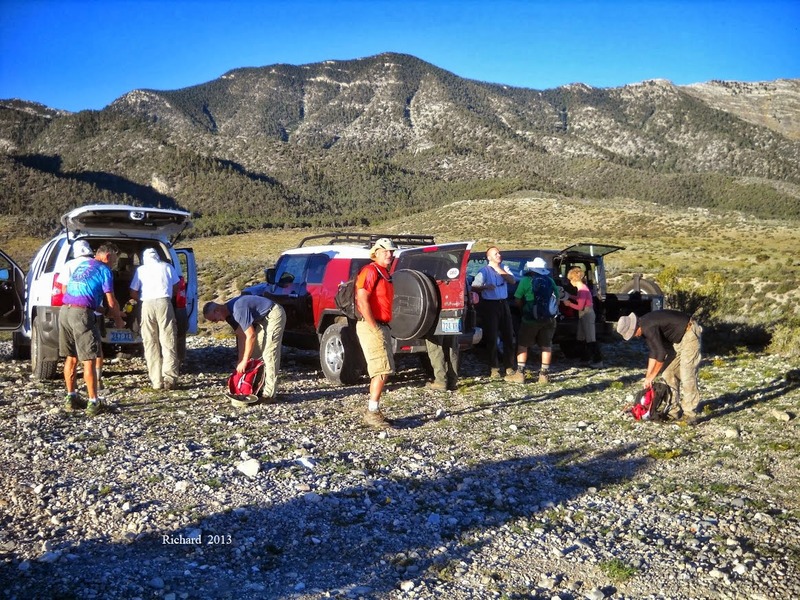 Seven hikers arrived at the Red Rock Canyon National Conservation Area BLM Visitor Center to begin the 12 mile hike around the Grand Circle Loop this morning. The air was fresh and the energy was high. 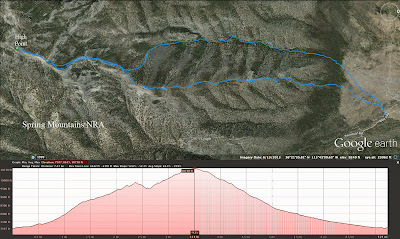 Even though the hike was advertised as a moderate hike, the hikers who attended were capable of a moderately strenuous pace so we dropped down to the old road trail that headed almost straight up to the White Rock Hills 4 miles away. These first 4 miles were the least interesting part of the hike as we simply hiked through the desert on a steady uphill climb. The washes that we crossed were in a state of disarray. 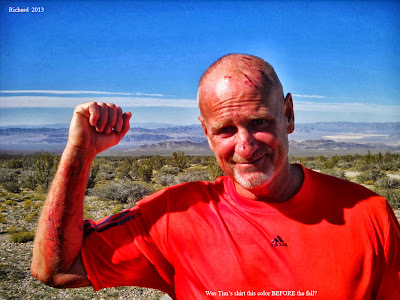 The rains that we had over the summer monsoon season, really did a number on the Red Rock washes and the trail runners that we usually see on the Grand Circle were absent. Only time will return the trail to its normally pleasant condition. At 4 miles, we crossed the scenic loop for the first time. After this, we climbed up and junctioned with the White Rock Hills Loop and dropped down to cross the wash and climb the continuation of the old road trail. Finally, we reached the White Rock Springs Rd Trailhead where we thought we might see more club hikers that wanted to join us. We had heard from a passing hiker that there was one gentleman waiting at one time, however, we got there 30 minutes later than expected and he had already left. Here, we took a small break at the high point of the morning then continued by hiking down the White Rock Springs Road, crossing the scenic loop and finding the washed out trail. This part of the hike has a few ups but mostly downs as we enjoyed the scenery of the canyon floor and felt amazed at the green grass and bushes that the desert landscape showed. It seldom has such green color. We arrived at our next meeting place only 15 minutes late but there was no one waiting for us, again, at Sandstone Quarry. Here, we took our long break in the shade with the mosquitoes. Nine miles down and three to go. We slowed down just a little but the most beautiful part of the hike was remaining and we enjoyed our walk next to the red rock among the yellow flowers. 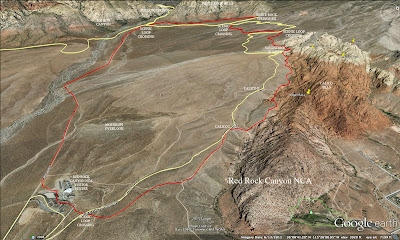 Our hike passed through Calico II and Calico I then reached the small trail that led up to the Visitor Center. For future hikes, we arrived at the White Rock Springs Rd Trailhead 2 hours after beginning; then there was 1.25 hours between there and Sandstone Quarry. Hopefully, we didn't miss anymore hikers that wanted to hike with us. The plan needed some improvement! 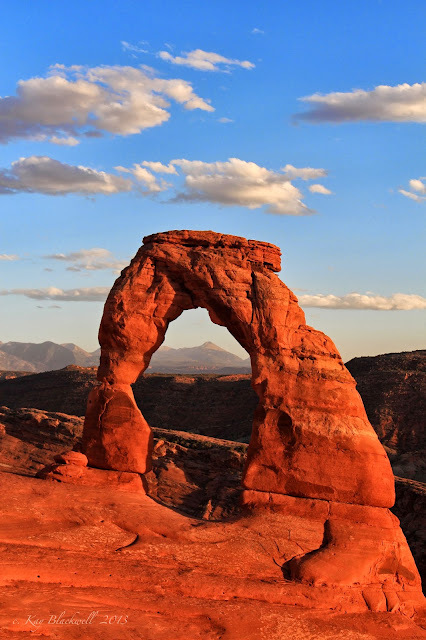 Kay and John B. went to Moab, Utah for the fourth time this past weekend to check out the area for a club trip in October of 2014. These photos should whet your appetite for the trip. Even though the weather was not great due to high winds and a little rain, we got several nice photos and saw everything we wanted to see. 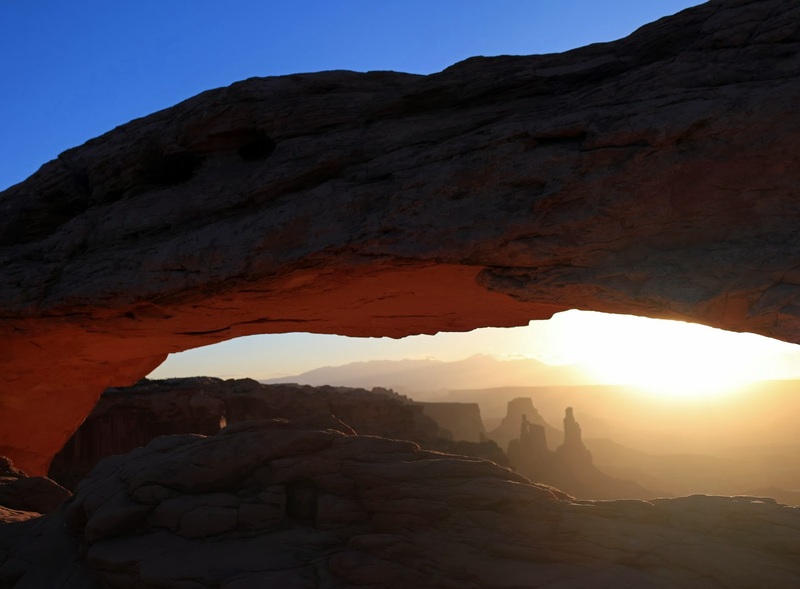 The next day, we woke for sunrise at Mesa Arch. There were around 15 other photogs there catching a gorgeous view. 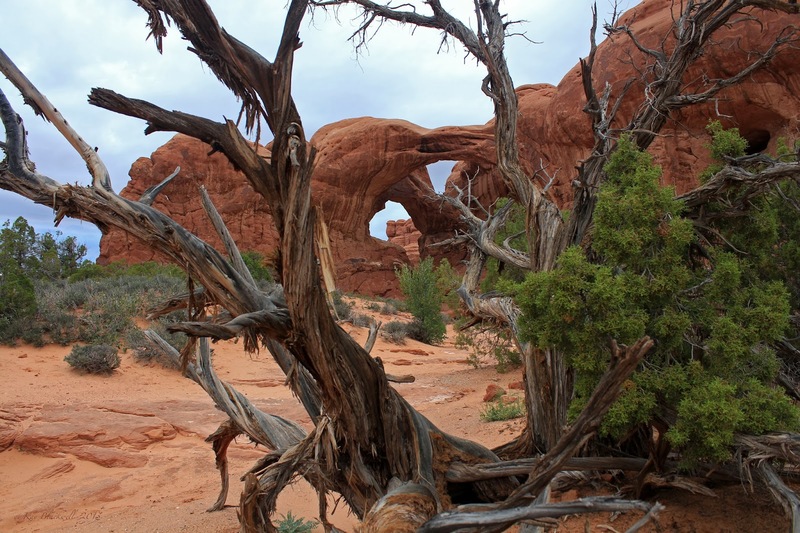 The dust in the air actually added to the Washer Woman Arch photos! We drove around the Island in the Sky of Canyonlands a little but needed breakfast and a nap! 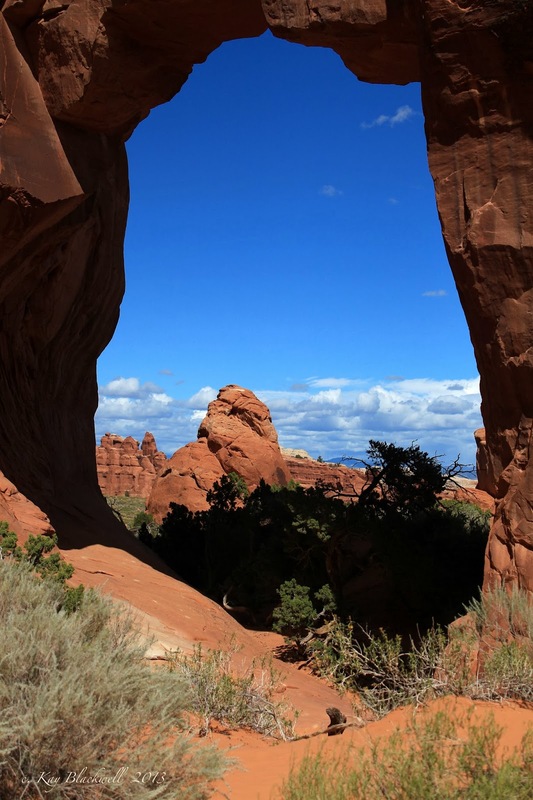 Later that day, we returned to Arches for a small hike at Park Avenue. 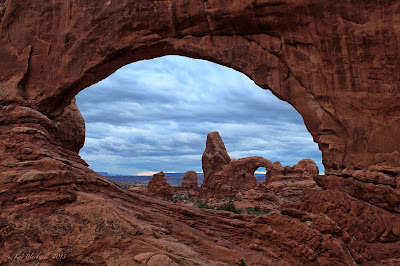 It was very dramatic with the threateningly cloudy skies. The next morning, we woke for sunrise photos of Turet Arch through the North Window. We arrived inside the window and looked around to find where the photo was to be taken from. When we peered through the dawn light up on the cliff across the small gully, we saw around 5 photogs lined up wondering when we were going to move out of their shot. Quickly, we scrambled over to them and enjoyed the photog party! By the time it was all over, there were around 10 photogs on the tiny ledge! Later that day, we found a parking place at Devil's Garden and only hiked out to Landscape Arch. The views were gorgeous again ... if you faced north! 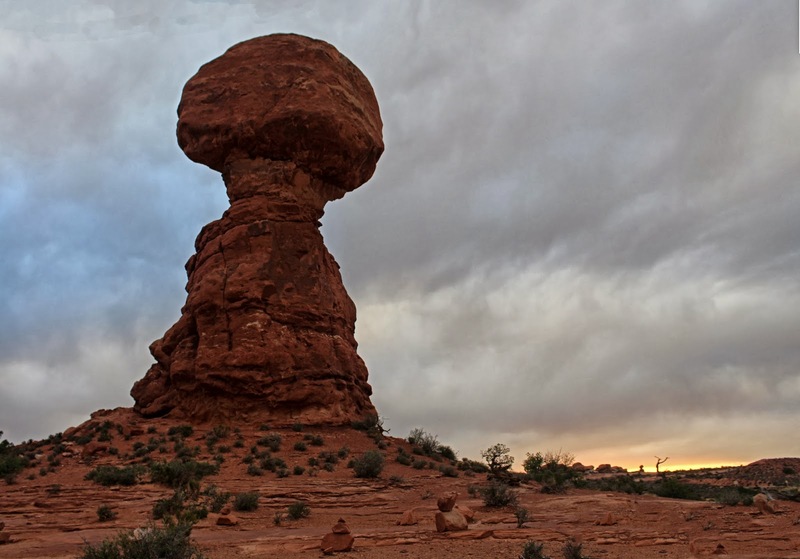 Moab is definitely a good photographer's vacation. 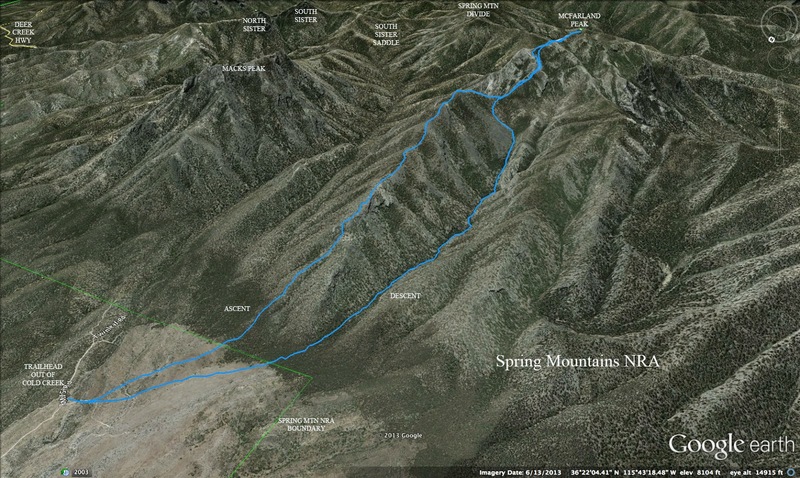 The hikes are either very short or very long and there is a lot of driving. When we plan the club outing, we will take all of this into consideration. 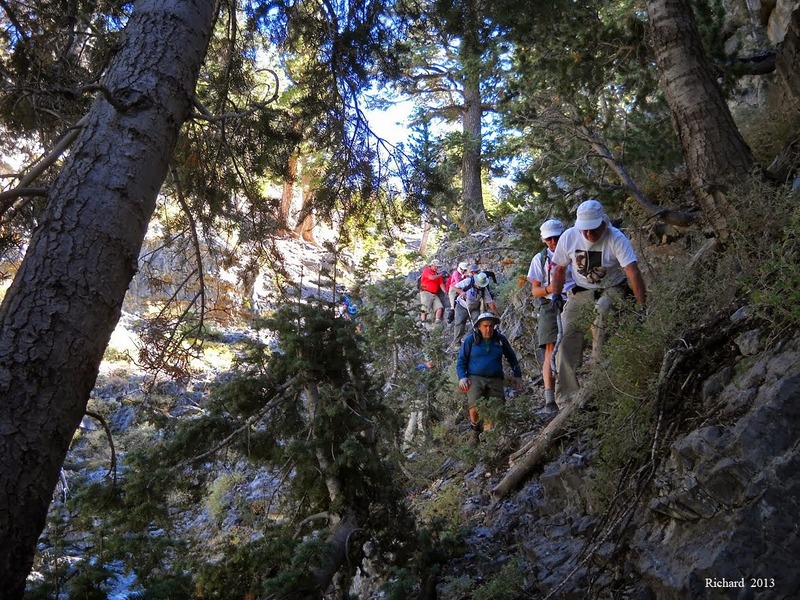 Tuesday, our hikers did a new hike for the club. Again, our Tuesday hikers did us proud! Mike OC writes the blog for us as Laszlo, Richard and Jerry offer the photos. Jerry also provided the GPS track. Thanks, guys, and congratulations! Stay to the right, guys! 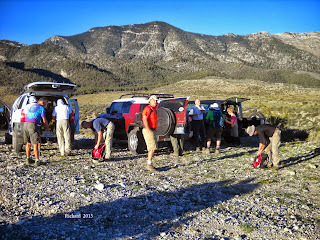 Exiting the vehicles at the trailhead, two massive bull elk darted past, setting the table for our adventure du jour. Majestic creatures. We set out after them, to no avail. We were high above the prisons, just below Cold Creek. 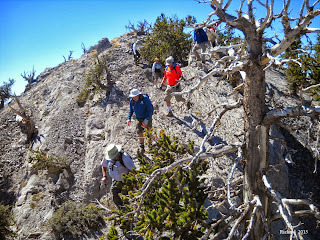 On the way to McFarland Peak via the North Ridge Route. With Richard Natale on point. Shortly after departing, we entered the treacherous Emerald Forest, where knifelike tree branches mercilessly assaulted us. Picture 11 warm bodies containing 110 pints of blood. The steep, fast-paced climb was a veritable lung-buster with little respite. A relentless, upward trudge into a blinding sun. Skittish horses scampered away, wary of these alien human intruders. Much later, with the forest far below and no sign of our equine friends, the pinnacle emerged above us. A barren, desolate crag at 10,742 feet above sea level. Lots of ditzy grins, as we all found a seat and rummaged for some nourishment. Tough part of the hike is over, right? Hah! Fugghedaboutit! An entirely different descent route proved to be the real monster. 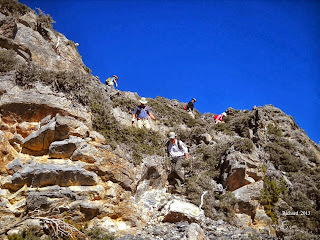 Incredibly steep terrain with unstable talus and sharp limestone. Huge boulders cascading down the mountainside. Sounded like the Khumbu Icefall on a bad day. An excruciatingly slow and tedious descent. At one particularly dicey section, Jerry Thomas' GPS registered a mere tenth of a mile gain in thirty minutes. Holy tortoise, Batman! We'll never get back to the Bat Garage at this rate! Baptism of fire: There was a newbie in our midst on this autumn day: Richard Thompson of Los Alamos, New Mexico. An old friend and former co-worker of the author. Welcome to the Tuesday ABF jaunt, RT. Toughest hike of the year? Perhaps. In the top five? For sure. 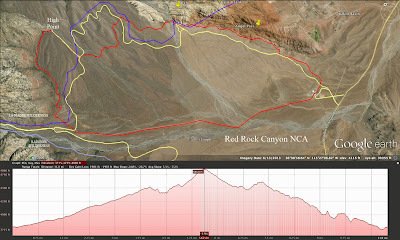 Vitals: 8.1 miles, 4800 vertical feet, 7 3/4 hours, 2 quarts of blood. 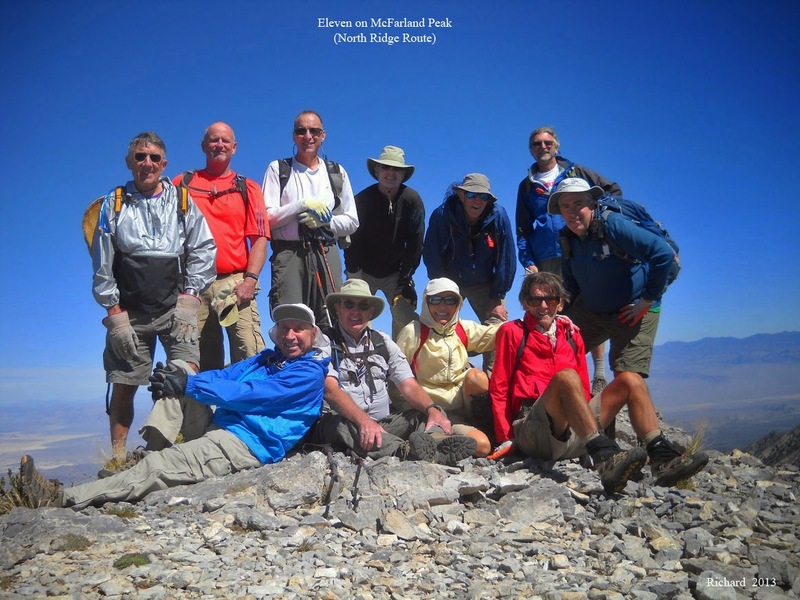 The Early Risers hikes are nearing an end for this year as the Around the Bend Friends regular club hikes will soon be switching to the Red Rock Canyon arena on a daily basis. But, today, there were five hikers that arrived at the Cowboy Trails parking area and began their hike just as the sun was coming up over the horizon. 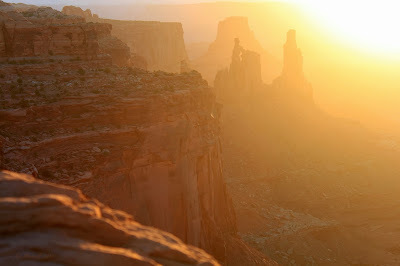 They hiked to the upper cowboy buildings and dropped down to make their approach into Cave Canyon. Echo Canyon led off to the right and Cave Canyon began steeply up to the left. 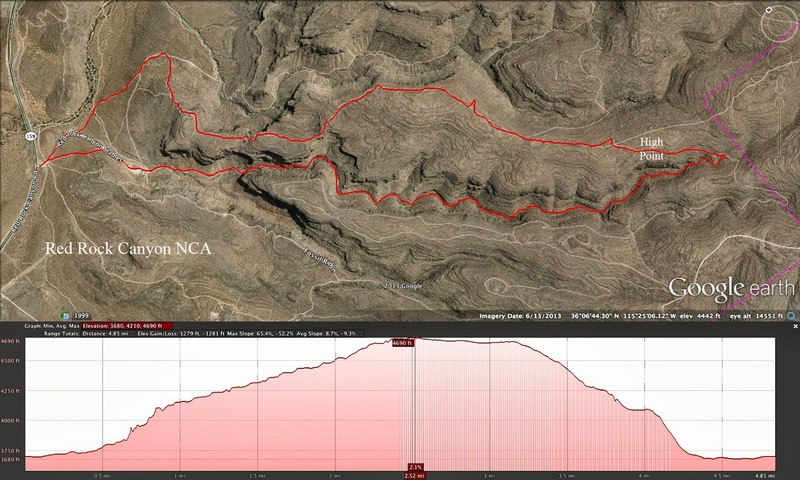 The first hill leading up into the mouth of the right side of the canyon is the toughest climb. 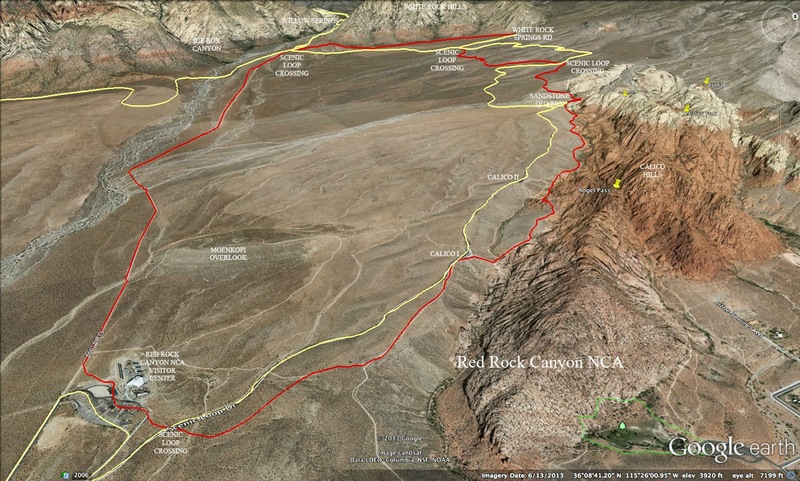 Below you, to the left, the center of the canyon is strewn with gigantic boulders. The first dry fall of note is the most difficult and many hikers stop here before they have barely begun. It is difficult but not impossible and we managed. With more effort, there is an up and around way to go on the left side of the canyon. The brush, boulders and small scrambles kept coming for a couple of miles. The trail is there but it is difficult to find at times. You can't get lost! Just stay between the walls. 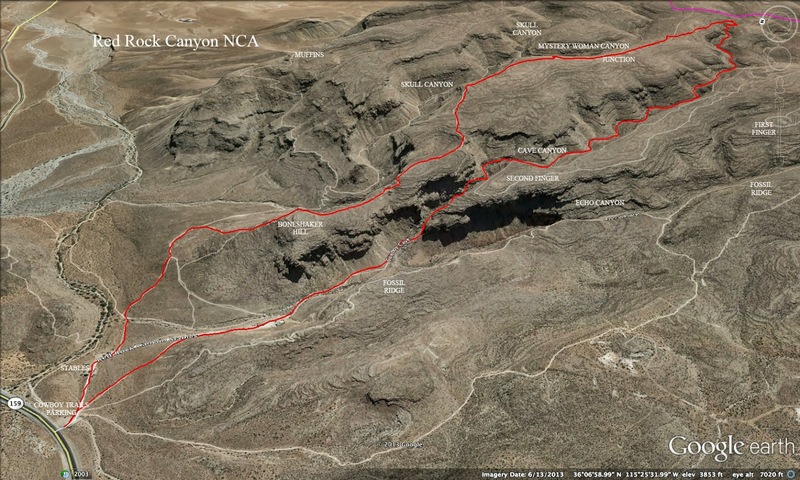 Finally, the canyon split. To the right, the canyon peters out pretty quickly. 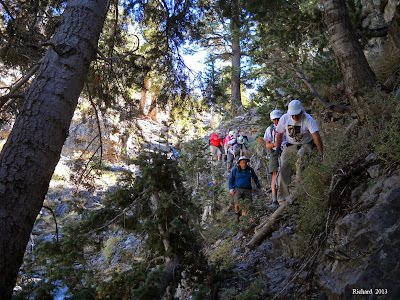 We continued our climb in the left fork. Again, the brush covered the trail but we made it up to the dry fall box. Straight ahead is a difficult route to scramble up to the top. 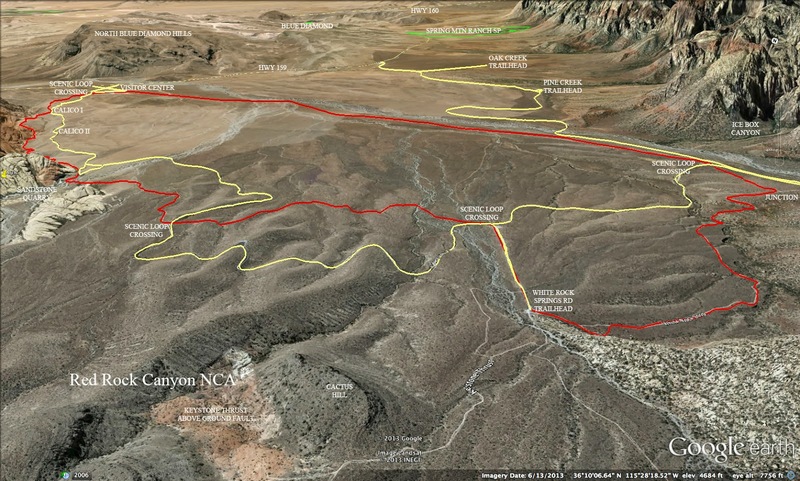 On the left side, there is a relatively easy route. 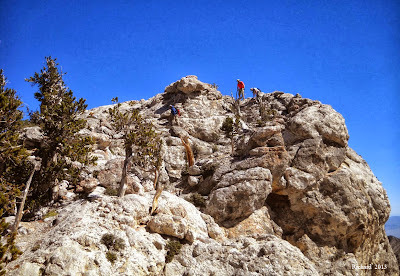 Three of us chose to take the route on the right side which is considered medium in difficulty. The photo to the left was taken at the top. A little further up the wash, we reached a trail crossing our path. Here, we turned left. Not long after, we came to the Boneshaker sign propped up by rocks. Unless you have been hiking these hills for a few years, you would never know that once upon a time this sign actually said, "BONESHAKER!" with a skull and crossbones for decoration. Bicyclists who use these trails named this particular route "Boneshaker" because it is the most difficult route to ride down. 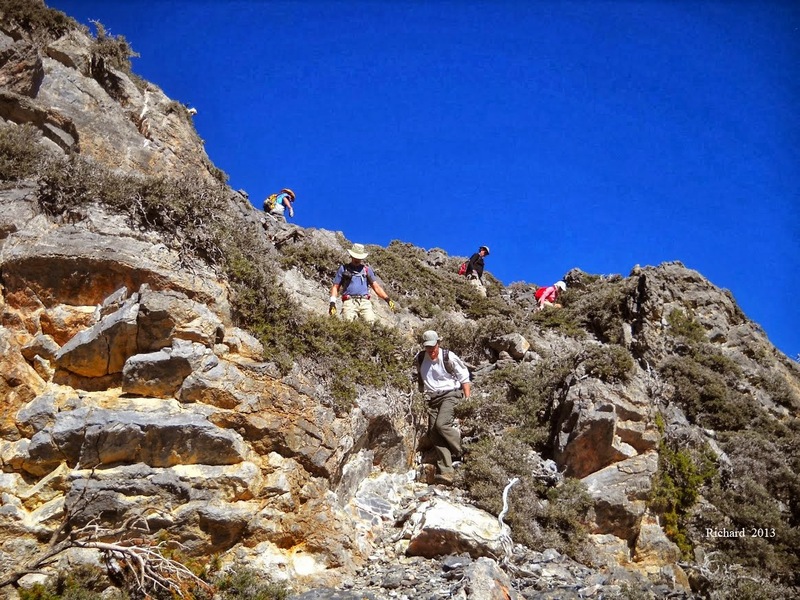 It was unclear to us, as hikers, as to who on earth would ever try such a thing! (But, I'm getting ahead of myself.) We hiked down what started as a smooth and easy slope with views of Mystery Woman Canyon on the right and Cave Canyon on the left (seen in the photo to the left). When we reached the view of Boneshaker Hill (proper), we stopped on some nice rocks with a view and had our break. 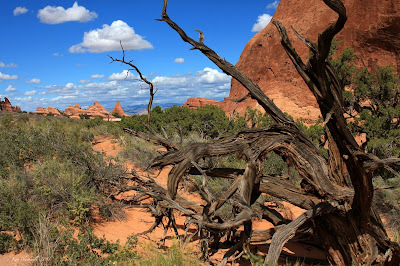 From our perch in the shade, we could see the Calico Hills and the Red Rock escarpment. On Fossil Ridge, we saw two friends that we had passed earlier and a small group of horse riders. Carefully, we dove down Boneshaker Hill. It is very steep and slippery and includes a couple of bike jumps for those inclined to risk their neck. 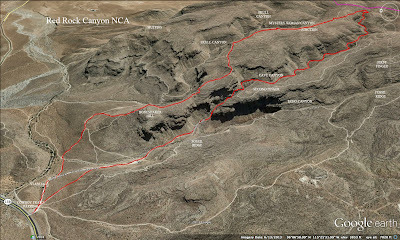 At the bottom, we junctioned with the Muffins/Skull Canyon Trail and skirted the hill around to the left. This trail led us back to the horse stables and corral through blooming chinchweed. 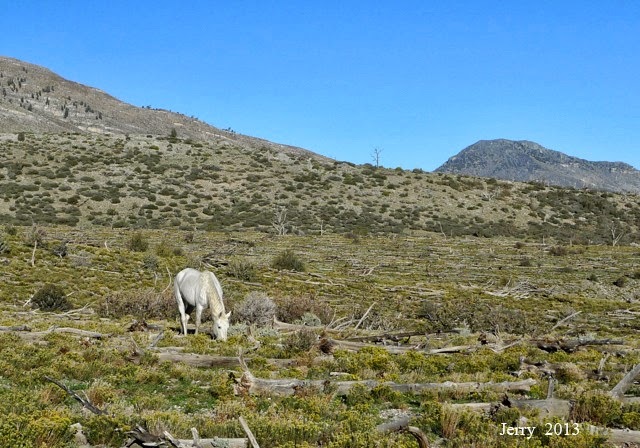 At the end of our hike, we passed by the burro that used to be wild. The kids like to see him when they come out here. 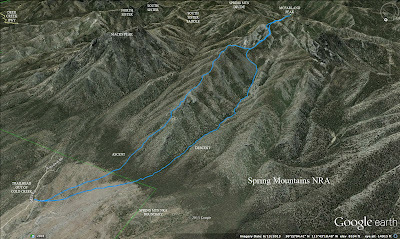 Our hike, today, was 5 miles with around 1600 feet of elevation gain.